Reading and share top 105 famous quotes and sayings about Al Gore by famous authors and people. 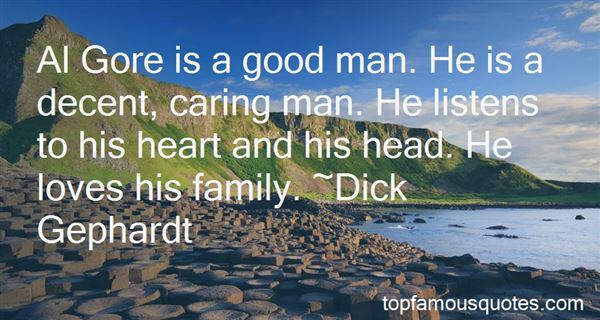 Browse top 105 famous quotes and sayings about Al Gore by most favorite authors. 1. "Pengalaman-pengalaman yang lembut dan santai mungkin tidak tercatat dalam garis-garis kehidupan secara nyata. Namun pengalaman-pengalaman yang keras dan getir tentu akan tergores dalam-dalam pada jiwa, pada sikap dan perlakuan, dan tak mustahil akan mengubah sama sekali keperibadian seseorang." 2. "Al Gore's problem, in my view, is that he never liked politics. He's actually deeply uncomfortable in it but felt he had to do it because of his father. He's much more comfortable in a private sector role and has, in fact, been much more successful in a private sector role, and I admire him for that." 3. "Al Gore seems to have found a great political ploy: Picking up whatever issue he is most vulnerable on and championing the cause. Perhaps he will start to champion perjury statutes and obstruction of justice." 4. "As a small kid, I came across things like these early Edward Gorey books in department-store bookstores. These were these really unusual objects to me. I didn't know how they fit into the comic world or into newspaper comics." 5. "Al Gore clearly has the vision... it's a much better vision than that of George W. Bush." 6. "I look at the Senior Al Gore that I had the chance to serve in the Senate with. A great human being. He went down to defeat to this right wing bunch back at the time." 7. "Even leaving aside government policy, whole industries are already making expensive changes around the perceived need to 'go green.' Al Gore and countless other prophets of global catastrophe are making megamillions pushing these expensive solutions. Schoolchildren around the globe are being frightened by tales of impending calamity." 8. "One of the most surreal moments in this election was after the third debate, when I heard a talking head say, Al Gore won on substance, on the issues. But you have to give the victory to Bush because he seems presidential." 9. "All I really want to be is boring. When people talk about me, I'd like them to say, Carol's basically a short Bill Bradley. 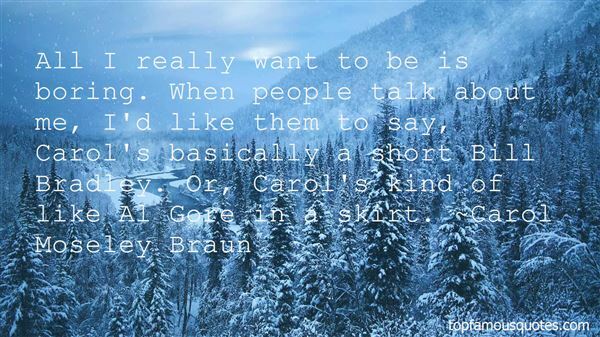 Or, Carol's kind of like Al Gore in a skirt." 10. "All the PG-13 superhero movies are depriving me of the gore that I need." 11. "I've known Al Gore since he was born. He has been the best little boy, he was a boring child, and he has never done anything wrong." 12. "Al Gore may think Medicare is at a crossroads, but his plan puts it on a highway to bankruptcy." 13. "I was pregnable once," Merill thought to contribute. She remembered how troublesome it made getting around, having a ripe belly. Couldn't roll properly, couldn't hop properly, couldn't romp or flop properly. There were the cravings for roasted cabbage—she loathed cabbage, with its leaves and growing in rows. And labor! Merill passed out during childbirth. She'd endured burns, lacerations, rips, serrated teeth, nails, hooks and a trove of unmentionable harm-inflictors. Labor trounced them all and wriggled gleefully in the spray of blood and gore. "Being pregnable is no good. No good at all. Like growing a bitter melon in your belly." 14. "Tanith frowned. Did people still go on DATES any more? She was sure they did. They probably called it something different though. She tried to think of the last date she'd been on. The last PROPER date. Did fighting side by side with Saracen Rue count as a date? They ended up snuggling under the moonlight, drenched in gore and pieces of brain - so it had PROBABLY been a date. If it wasn't, it was certainly a fun time had by all. Well, not ALL. But she and Saracen had sure had a blast." 15. "Al Gore is a good man. He is a decent, caring man. He listens to his heart and his head. He loves his family." 16. "Svaka škola se placa, a narocito vecernja. U višoj životnoj, koju sam apsolvirao, školarina je ponekad bivala astronomska.I, što je najgore, još uvek ne znam da li je vredelo..."
17. "But see, amid the mimic routA crawling shape intrude!A blood-red thing that writhes from outThe scenic solitude!It writhes!- it writhes!- with mortal pangsThe mimes become its food,And seraphs sob at vermin fangsIn human gore imbued.Out- out are the lights- out all!And, over each quivering form,The curtain, a funeral pall,Comes down with the rush of a storm,While the angels, all pallid and wan,Uprising, unveiling, affirmThat the play is the tragedy, "Man,"And its hero the Conqueror Worm." 18. "Don't forget to vote for Bill Clinton and Al Gore. Stay home if you're voting for Dole." 19. "Scott goes to the computer and loads a chart that says something about global warming. Scott says, "See?" Judy says, "I don't think global warming is important, people shouldn't need to use global warming as an excuse to stop being wasteful." Scott says, "How can you not believe this?" Judy says, "There has been golf ball-sized hail storms and hurricanes for a long time, it didn't just start all of the sudden. In the movie Al Gore drives in an SUV." Scott leaves to have a cigarette. Cory says, "Al Gore owns his own farm." Judy stares at the TV. Judy thinks, "No one in this room cares about global warming, this is ridiculous, we are all smoking cigarettes and eating cheese, how can any one of us care about voting? No one in this room cares about anything." 20. "Ali na povratku kuci desilo se nešto cudesno, sigurno se secaš erupcije vulkana na Islandu?Secam se, kaže Fvonk, strašne su sile bile ne delu.Bogami jesu, kaže Jens, zastrašujuce sile, ali obo što je bilo tako blagosloveno oko te erupcije bilo je što se pepeo rasprišio po atmosferi tako da avioni nisu mogli leteti, i to je bilo kao poruceno, osetio sam, da, znaš li šta sam osetio, Fvonk, osetio sam da su mi molitve uslišene, da ima necega tamo gore, neke sile, ne znam, ovoga ili onoga, što me je videlo i razumelo, tako je lepo biti viden, i tako je fantasticno kada se stvori prostor u kome se niko inace ne bi našao. Trebalo bi da covek bude na nekom drugom mestu, ali biva sprecen i onda se stvara poseban prostor, koji u suštini ne postoji, razumeš li, i u tom prostoru covek je potpuno slobodan, potpuno i savršeno slobodan.Razumem, kaže Fvonk." 21. "Obama sounded like Al Gore on global warming. The more the case for man-made warming falls apart, the more hysterical Gore gets about an imminent catastrophe. The more public support his stimulus bill loses, the more Obama embraces fear-mongering." 22. "Things keep happening all around you. There is violence, there is gore, there are people who will use you and never look back to see what became of you, and worse, there are people who will break you into smithereens before they leave to make sure they don't have to look back to see what became of you." 23. "Ik ga voor je zingen, een beetje vals misschien, maar ik zing toch. Ik zing terwijl jullie creperen, ik dans op je gore lijk..."
24. "The End of the Raven"On a night quite unenchanting, when the rain was downward slantingI awakened to the ranting of the man I catch mice for.Tipsy and a bit unshaven, in a tone I found quite craven,Poe was talking to a Raven perched above the chamber door. 'Raven's very tasty,' thought I, as I tiptoed o'er the floor. 'There is nothing I like more.'[... ]Still the Raven never fluttered, standing stock-still as he utteredIn a voice that shrieked and sputtered, his two cents' worth -- 'Nevermore. 'While this dirge the birdbrain kept up, oh, so silently I crept up,Then I crouched and quickly leapt up, pouncing on the feathered bore.Soon he was a heap of plumage, and a little blood and gore --Only this and not much more." 25. "Less is more, unless you're Al Gore." 26. "My wife's name was Mala. The marriage had been arranged by my older brother and his wife. I regarded the proposition with neither objection nor enthusiasm. It was a duty expected of me, as it was expected of every man. She was the daughter of a schoolteacher in Beleghata. I was told that she could cook, knit, embroider, sketch landscapes, and recite poems by Tagore, but these talents could not make up for the fact that she did not possess a fair complexion, and so a string of men had rejected her to her face. She was twenty-seven, an age when her parents had begun to fear that she would never marry, and so they were willing to ship their only child halfway across the world in order to save her from spinsterhood." 27. "As a dad, you are the Vice President of the executive branch of parenting. It doesn't matter what your personality is like, you will always be Al Gore to your wife's Bill Clinton. She feels the pain and you are the annoying nerd telling them to turn off the lights." 28. "Život mi je kao djevojcici bio glazba koja se neprestano pojacavala.Sve me moglo dirnuti.Pas koji prati neznanca.Od toga sam osjecala toliko mnogo.Kalendar koji prikazuje pogrešan mjesec.Zbog toga sam se mogla rasplakati.I plakala sam.Gdje završava dim iz mog dimnjaka.Kako se prevrnuta boca zaustavila na rubu stola.Cijeli život ucila sam kako manje osjecati.Iz dana u dan osjecala sam sve manje.Je li to starenje?Ili nešto još gore?Covjek se ne može zaštiti od tuge,a da se istovremeno ne zaštiti i od srece." 29. "In via Belgrano presi un tassì; insonne, invasato, quasi felice, pensai che nulla è meno materiale del denaro, giacché qualsiasi momenta (una moneta da venti centesimi, ad esempio) è, a rigore, un repertorio di futuri possibili. Il denaro è un ente astratto, ripetei, è tempo futuro. Può essere un pomeriggio in campagna, può essere musica di Brahms, può essere carte geografiche, può essere giuoco di scacchi, può essere caffé, può essere le parole di Epitteto, che insegnano il disprezzo dell'oro; è un Proteo più versatile di quello dell'isola Pharos." 30. "Samoca nije živeti sam, samoca je kad nismo sposobni da pravimo društvo nekome ili necemu što se nalazi duboko u nama, samoca nije usamljeno drvo nasred puste ravnice, to je rastojanje izmedu skrivenih sokova i kore, izmedu lista i korena. Vi bulaznite, sve to što pominjete medusobno je povezano, nema tu nikakve samoce, U redu, pustimo sad drvo, nego se zagledajte u sebe, i naci cete samocu, Kao što rece onaj drugi, hodati usamljen kroz gomilu, Još gore od toga, biti usamljen tamo gde ni nas samih nema, Danas ste užasno raspoloženi, Imam i ja svoje loše trenutke, Nisam ja govorio o toj samoci, nego o drugoj, onoj koja nas prati, podnošljivoj, onoj koja nam pravi društvo, Cak i nju ne možemo uvek da podnesemo, vapimo za necijim prisustvom, nekim glasom, a ponekad taj isti glas i to isto prisustvo služe jedino zato da ucine samocu još nepodnošljivijom." 31. "If Al Gore had allowed us and if the Florida Supreme Court had not intervened and rewritten the law, which they're not supposed to do, we could have certified, which is a mere procedural action, and then after that, they could have petitioned any justice for a recount statewide with uniform standards." 32. "Being with Al Gore on the red carpet in Cannes was exciting - he's like a rock star unto himself!" 33. "Honestly, when I had the idea to make 'An Inconvenient Truth,' and I was going out and raising the money, and I said, 'I want to make a movie about Al Gore's slide show, will you give me a million dollars?' People thought I was insane, looked at me cross-eyed." 34. "Sure, 'An Inconvenient Truth' was my first documentary. What a wonderful experience. I saw Al Gore doing his slideshow presentation, and had this nutty idea that we had to make a movie out of it." 35. "In my lifetime, we've gone from Eisenhower to George W. Bush. We've gone from John F. Kennedy to Al Gore. If this is evolution, I believe that in twelve years, we'll be voting for plants." 36. "Al Gore, the former vice-president of the United States, lives in a mansion that uses more electricity than the average family's bungalow! David Suzuki rides on a bus that uses more fuel than a Smart car to get across Canada! Oh my God! And this is just the tip of the vanishing iceberg!" 37. "Znala sam da me želiš. To je jedino oko cega nikad nisam dvojila. Ali dovuci te u svoju postelju — tebe, najveceg kurvara u kršcanskom svijetu — zaboga, bilo je to gore nego onda kad sam Bertiea morala odvuci zubaru. I"
38. "Wayside school is falling down, falling down, falling down,Wayside school is falling down my fair lady.Kids go splat as they hit the ground, hit the ground, hit the ground,Kids go splat as the hit the ground my fair lady.Broken bones and blood and gore, blood and gore, blood and gore,Broken bones and blood and gore my fair lady.We don't have to go to school no more, school no more, school no more,We don't have to go to school no more my fair lady." 39. "...ali ljubav u srcu - to je zvijezda gore na nebu. Skriva se u noci, ali utrnuti ne može..."
40. "-Tomo! Vi imate - suza? (...) -Recite zbog cega vas je snašla tolika bol da vam se srce rasplakalo? Trenutak šutnje, a onda on odvrati šapatom koji odaje teški napor: -Obešcašcujem vas time što sam ovdje! (...) -Da mogu popraviti to, kneginjice, pretvorio bih sve što je gore na palubi živo u leševe. -Pa ipak ste život svoj žigosali za sva vremena - sramotnim imenom viteza otimaca. -Vitez otimac slavan je i castan prema onom mom drugom nedjelu. -Ubojica ste? -Mnogo gore. (...) -Što ste još? -Svetogrdnik! -Svetogrdnik? Kakvu ste to svetinju pogrdili? -Vas! Vas..."
41. "Do I get paid, too? ''Yes,' he said without hesitation. This scared me, because Crawley gave money like bulls gave milk: not at all, and you get gored for asking. If he had already decided this was a paying job, it must be horrible beyond words." 42. "Al Gore has dedicated his life to detail. George W. Bush has not. He's the first to admit it." 43. "Fear is essential in horror fiction. Gore is optional." 44. "Al Gore adopted three utterly different personas in three national presidential debates." 45. "Al Gore is an heir to the old czars and commissars. He never saw a regulation he didn't like." 46. "The Olympics are coming... and it's a big problem in American politics, because the problem with holding the Olympics this fall is that we're all going to be focused on the Olympics, and it makes that window of opportunity for Gore to win the election that much smaller." 47. "If you read Shakespeare's stage directions, all the gore and violence is right in there." 48. 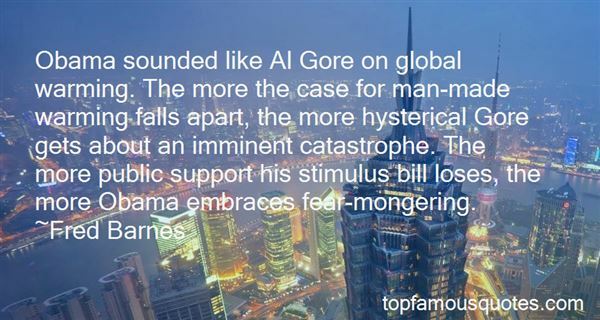 "Al Gore is not just whistling in the wind. Global warming is for real. Every scientist knows that now, and we are on our way to the destruction of every species on earth, if we don't pay attention and reverse our course." 49. "L'essere umano è davvero una creatura straordinaria. Ha scoperto il fuoco, edificato città, scritto magnifiche poesie, dato interpretazioni del mondo, inventato mitologie etc... Ma allo stesso tempo non ha smesso di fare la guerra ai suoi simili, non ha smesso di ingannarsi, di distruggere l'ambiente circostante. La somma algebrica fra vigore intellettuale e coglioneria dà un risultato quasi nullo. Dunque, decidendo di parlare di imbecillità, rendiamo in un certo senso omaggio a questa creatura che è per metà geniale, per metà imbecille"
50. "In 1879 the Bengali scholar S.M. Tagore compiled a more extensive list of ruby colors from the Purana sacred texts: ‘like the China rose, like blood, like the seeds of the pomegranate, like red lead, like the red lotus, like saffron, like the resin of certain trees, like the eyes of the Greek partridge or the Indian crane…and like the interior of the half-blown water lily.' With so many gorgeous descriptive possibilities it is curious that in English the two ancient names for rubies have come to sound incredibly ugly." You are blind to the present and we are blind to the future"